The dusky-green oropendola (Psarocolius atrovirens) belongs to the family of New World orioles and oropendolas, the Icteridae. The dusky-green oropendola species is distributed in Bolivia and Peru. The males of these oropendola species are larger than the females. These oropendolas are monotypic species. The dusky-green oropendola (Psarocolius atrovirens) is a medium-sized oropendola. The males measure 40 cm and the females measure 30 cm. They weigh between 150 to 300 grams. The dusky-green oropendola has over all olivaceous (dark greenish brown) plumage. The throat and head are darker. The ear-coverts are paler. The tail is brownish with contrastingly yellow outer rectrices. The bill is long, thick and pale blue with pinkish tip. The irises are blackish brown. The legs and feet are pale gray. The call of the dusky-green oropendola is a load "cho.co..cho.co" sound. The dusky-green oropendola species are distributed in Bolivia and Peru. They are distributed in the eastern slopes of the Andes Mountains in central and southern Peru and central Bolivia. 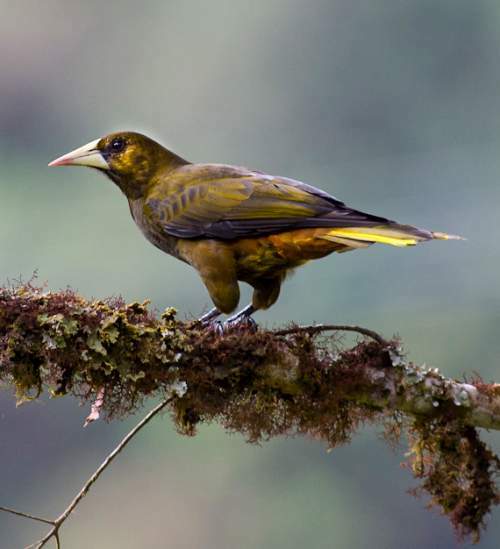 The Important Bird and Biodiversity Areas (IBA) of the dusky-green oropendola species in Peru are, Santuario Histórico Machu Picchu, Playa Pampa, Manu, Cordillera Yanachaga and Cordillera Vilcabamba. The IBAs of these dusky-green oropendola species in Bolivia are, Yungas Superiores de Mosetenes y Cocapata, Cuenca Cotacajes, Yungas Superiores de Madidi and Yungas Superiores de Apolobamba. These dusky-green oropendola species have moderate forest dependence. They normally occur in altitudes from 800 to 2,600 meters. The natural ecosystems and habitats of these dusky-green oropendola species include tropical and subtropical moist montane forests, river canyons, foothill forests and tropical and subtropical moist lowland forests. The diet of these dusky-green oropendola species consists mainly of insects and fruits. A variety of wild fruits, invertebrates, insects, small vertebrates, nectar and fruits are their primary food. The breeding season of the dusky-green oropendola species is from October to December. These species are monogamous and breed in small colonies. The males have been observed to make display flights. These dusky-green oropendola species are non-migratory resident birds. The populations in higher elevations move to lower levels during winter. The global population size of the dusky-green oropendola (Psarocolius atrovirens) has not been quantified. The overall population trend of the species is considered to be stable. In most of its range, this species is reported as common (Stotz et al. 1996). The generation length is 4.6 years. Its distribution size is about 324,000 sq.km. Habitat alteration, fragmentation and destruction and deforestation are the main threats that are endangering the survival of these oropendola species. The dusky-green oropendola (Psarocolius atrovirens) does not approach the thresholds for being Vulnerable either under the range size criterion, or under the population trend criterion or under the population size criterion. The CITES (Convention on International Trade in Endangered Species of Wild Fauna and Flora) status is ‘Not Evaluated’ for the dusky-green oropendola (Psarocolius atrovirens). The dusky-green oropendola (Psarocolius atrovirens) is closely related to chestnut-headed oropendola (Psarocolius wagleri) and russet-backed oropendola (Psarocolius angustifrons). Current topic on Birds of South America: Dusky-green oropendola - Psarocolius atrovirens.